Simon gained a degree in Physics and Electronics; always immersed in a technical career. Elected a Director of the Association of Security Consultants for 12 years, he is also a member of the Institution of Engineering & Technology (formerly IEE) and an accredited Assessor for the National Endowment for Science, Technology and the Arts (NESTA) on CCTV and related security systems. He is Technical Lead on the CCTV National Standards Forum and sits on the British Standards Institution CCTV committee. As an Engineer with 27 years’ experience in commercial, military & security systems design, including technical sales for large and small security systems companies, Simon’s work focuses on surveying, design, cost estimating, specifications, tender processes and managing projects. In addition, he has provided expert witness services in CCTV and forensic analysis of video and audio recordings. Simon has developed 3D graphics techniques and software for the CCTV industry, as well as accepting speaking invitations for conferences, television and radio, with many commissions to create articles and graphics for industry periodicals. In 2005 and 2011 he entered the Security Excellence Awards and was a finalist in the ‘Best Security Consultant’ category. Once upon a time, say 25 years ago, CCTV cameras came in one shape: big and boxy. In recent years technology has given us so many more types to choose from. We’ve gone from simple to bewildering. So let’s explore some of the camera types available. The simplest form is still a simple box to which you attach the lens of your choice at the front and cables to the rear. Mount it somewhere and monitor it. Incidentally, some ‘box’ models have a built-in lens, maybe even a zoom lens, but these are not common. If the naked camera and lens is expected to suffer dirt, rain, frost, heat or tampering, etc., a protective enclosure called a ‘housing’ is recommended. Basic dust-proof ones are simple rectangular or cylindrical boxes with a window for the camera’s view, cable outlets for power and video, and a fixing bracket. These are likely listed as “IP54” meaning the Ingress Protection is officially “dust protected” (5) and “protected against splashing water” (4) but not rain-proof, so often fine inside buildings. For external use we need to upgrade to at least IP65 (dust-tight and protected against water jets) and add a sun shade to keep glare off the housing’s window. In hot and cold environments we add, respectively, ventilating fans/blowers to reduce camera temperatures and thermostatically-controlled electrical heaters to prevent window misting. A ‘windscreen’ wiper can be advisable in dirty environments, as can a squirting washer if extreme. Such ‘shoebox’ housings offer the flexibility for camera and lens to be changed easily as future needs require, and are easily carried by motorised pan/tilt units described below. Commonplace in recent years have been fully-integrated assemblies, with camera, lens and housing inextricably combined at manufacture, trading lack of flexibility for rapid installation. LED lighting is often built-in too. Small examples are often called bullet cameras because of their cylindrical form. Such is the miniaturisation of these technologies that their use is widespread in video intercoms, covert disguises (e.g. clock faces, smoke detectors), head-mounted on traffic wardens, police, etc. Domes have over the years become the housing chosen most often for these compact camera assemblies, largely I find because CCTV users consider them more visually appealing than the old ‘white shoebox’ of yesteryear. Vandal resistant domes are particularly useful. All can be quickly surface-mounted on walls/ceilings, recessed into ceiling tiles for a lower profile, or hung as a ‘pendant’ from external corner brackets or masts on a ‘swan neck’. Domes containing a static camera usually have a varifocal lens so that installers can tweak the precise field-of-view. 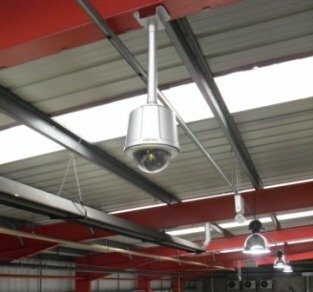 Recently, some IP (Internet Protocol) CCTV domes go so far as to fit these static cameras with ‘actuated’ innards that can drive the orientation, focusing and focal length by remote control after physical installation, but stop short of being regular pan/tilt domes (see below). Units with integral LEDs should be deployed with great caution: they seem like a good idea but they can cause terrible glare for the camera and attract wildlife. When news reports wish to illustrate ‘state surveillance’ CCTV in a single photograph, they seem go for a white shoebox housing on an ‘industrial-strength’ pan/tilt motor, as favoured 25 years ago. These are still chosen when good looks give way to power for swinging heavy loads such as large motorised zoom lenses, wiper motors, flood/spot lights, etc. Panning speeds of 60°/sec mean the whole assembly can ‘do a 180’ in three seconds, which is especially important if driving to an automated preset position in response to trigger from an alarm device. Structural soundness of all mountings is very important when the whole assembly can weigh many kilogrammes. Not all P/T units are wired to offer preset positions, and many have rotation end-stops, so choose carefully. Where lightweight equipment will suffice, PTZ (pan, tilt, zoom) domes sell by their millions. Indeed, so light are the innards that some claim to spin as fast as 360°/sec. Darkened domes can make the camera’s direction of view difficult to be ascertained by those surveilled, albeit also diminishing its low-light performance. The camera/zoom lens combinations share much with low-voltage camcorder assemblies, which is why 35:1 zoom is commonplace along with auto-focus. Small and powerful onboard computing power adds telemetry control plus options such as the aforementioned preset-memory function, privacy zones that automatically move to keep user-programmed areas obscured from the video, auxiliary alarm inputs/outputs, wireless communications, and video content analysis including automatic target following. For many years domes could not spin supplementary lighting so a swathe of static lamps was necessary at night. Some domes now include powerful LED lamps, either infrared or visible light that spin with the camera. ‘Ball’ PTZ cameras now combine lightweight dome innards in very robust metal ball-shaped cases carried by fast externally integrated pan/tilt motors. Attaching lights to these is so much easier too. The number of camera options we’re subjected to nowadays might seem bewildering and advancing technology will surely make it grow. Nonetheless, with this outline of the possibilities, you should be able to narrow down your choices very quickly. CCTV Camera Types Explained Simon Lambert explore some of the CCTV camera types available.